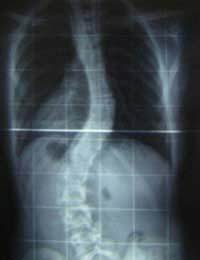 Home > Spinal Conditions > What is Scoliosis? Scoliosis is a relatively common condition affecting around 2% of the general population. It is an abnormal lateral curvature of the spine, sometimes occurring with two bends or ‘a double curvature’ resulting in an ‘S’ shaped spine. It is a developmental disorder rarely seen in newborns, and is much more prevalent in girls than boys. It can develop during early childhood, but is more common during adolescence. There is substantial evidence of a genetic link, meaning that if a parent has the condition, any of their off-spring will have the possibility of developing it at some point. There are two types of scoliosis, the first being idiopathic, the second being syndromatic. Idiopathic literally means ‘of no known cause’; syndromatic being related to, or as a result of, another disease. In adults, the cause can be due to degenerative changes in the spinal column. Scoliosis is often seen in patients suffering with cerebral palsy or spina bifida and is a consequence of these conditions. There are a range of symptoms that accompany this disorder and sufferers may present with only one or all of them. Occasionally the shoulder blades can appear to be uneven with the chance of one having a greater protrusion than the other, or ‘sticking out’. This prominence occurs if the vertebrae have a twist in them as well as the lateral curvature. An unevenness in the hips and waist is also a common symptom, accompanied by a general ‘leaning’ of the body to one side; again this is especially in the presence of a rotated vertebrae. If any of these symptoms are obvious, the Doctor will perform a thorough physical examination and diagnosis is confirmed with x-ray or scanned images. ‘S’ shaped curvatures are less obvious to detect by observation, as the two curves can counteract each other and the sufferer can appear to have a straight spine, however, the curves are very obvious on x-ray. There is generally no pain associated with this condition, more of an ache; pain can develop later on if the condition worsens and is left untreated, with the chance of progression more likely if the curvature appears in the upper spine than the lower regions. Treatment is very variable from patient to patient, with less intervention for major deformity in later life now required, thanks to advances in monitoring tools and the development of modern medicine. Minor cases in children are often left without medical intervention, with patients being monitored regularly for signs of progression. The use of plaster jackets and back braces is usually indicated for the young that require treatment, as their bones are not fully grown and can be ‘retrained’ to follow a new path of growth. Back braces and spinal casts help support the developing spine and can act as a guide. Compliance can be poor with adolescents possibly due to aesthetic reasons, comfort, and duration of being worn or other psychological reasons. It is important for children to be kept fully informed of their treatment and involved with the decision making process in order to try and prevent these issues arising. There are a number of support groups and information booklets available to sufferers which can be recommended by the GP or Practice Nurse. Spinal surgery is only indicated if the curvature is causing problems with nerve compression, (resulting in numbness or tingling in other areas of the body), with the treatment of choice being spinal fusion. It is very rare for spinal surgery to completely correct the curvature as this would be a very complex surgery with the possibility of many risks. The use of a Chiropractor may be recommended as they can sometimes increase the flexibility and strength of the spinal joints aiding mobility and lessening nerve compression. Doctor’s and Specialists are continually working on new treatments for this condition, a new treatment involving the use of implants, though research is still in its infancy. Scoliosis is a fairly common condition that may or may not need medical intervention. Any treatment needed must be thoroughly discussed between patient and Doctor to ensure the correct choices are made for each individual person. Psychological and emotional support is equally important for sufferers, especially in the cases of the more severe deformities.